Pieces: 953. Time for a tune-up at the LEGO City garage, here's always something going on at the big city garage. When the call for help comes in, the heavy-duty tow truck is ready to haul any car or truck back for repairs. 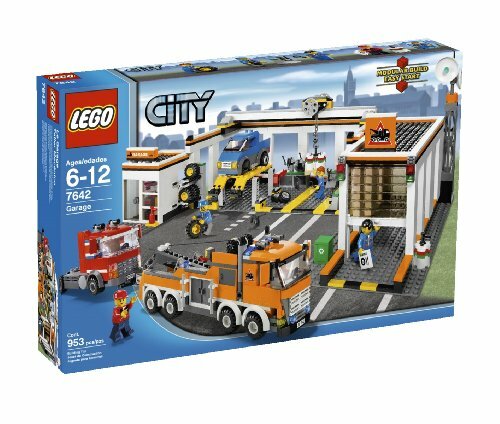 Use the auto lift, crane and tools to fix any problems and get those vehicles back on the road!Includes 4 minifigures and lots of accessories and spare tires. Tons of play opportunity: office building, workshop and garage and 3 vehicles included. Loaded with realistic functions - platforms really lift, sliding doors and gate!Garage, with attached buildings, measures an impressive 11 inches (27.9cm) by 17" (43.2cm). Tow truck towing tractor trailer cab measures a combined length of 14"(35.6cm).